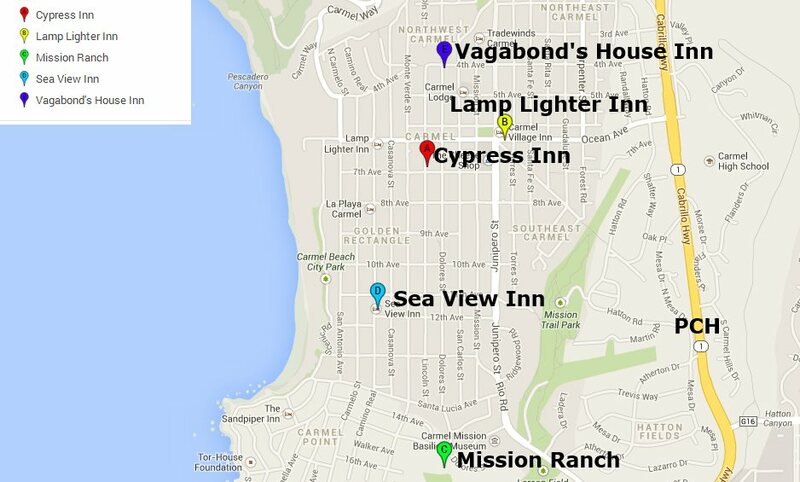 Carmel is one of our highly-recommended places to spend the night when you're driving the Pacific Coast Highway. In fact 2-3 nights would be better, as it's a relaxing spot and we just love strolling the streets to look into the best shops and find somewhere to eat for the night - and there are plenty of restaurants to choose from. If you're traveling with family then you might want to consider Monterey instead. It's only a few miles away but bigger and busier, with more things to do and see. 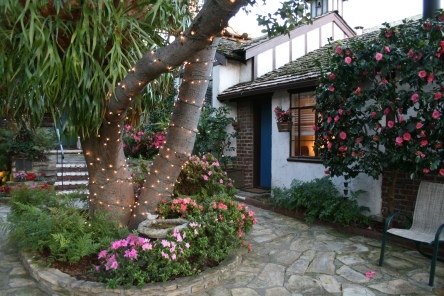 But if you're driving PCH as a couple and want a romantic place to stay then Carmel is always our choice. Carmel is only 2-3 hours south of San Francisco, depending which way you go. Take Highway 101 and it's nearer two hours from the center of San Francisco. Take the prettier PCH coastal route on Highway 1 and it's closer to three hours. Click on the links above for lengthy reviews and lots of photos. 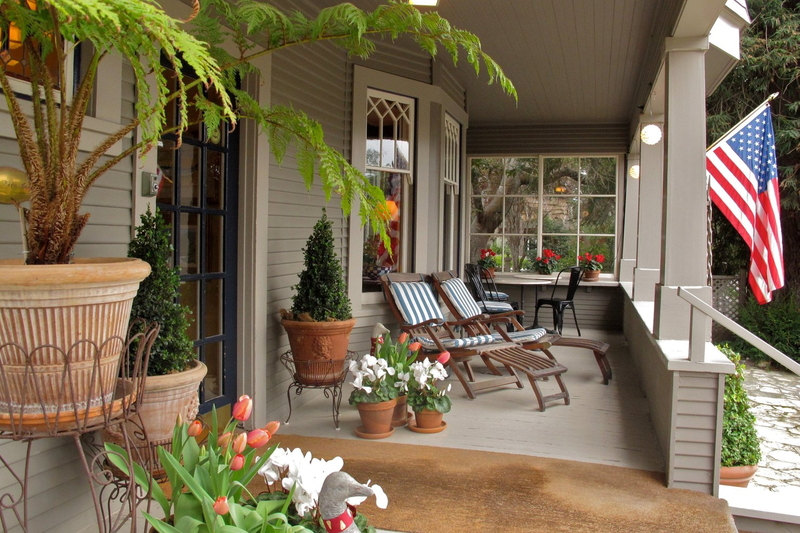 If you're planning a short stay in Carmel, the Mission Ranch has to be one of the accommodation options you consider. It's not just that it's owned by Clint Eastwood, but because it's a relaxing place set in 22 acres and centered on an 1850s farmhouse that has a charm all its own. There are 31 rooms, many with ocean views, and facilities include the six championship-standard tennis courts, a health club, a piano bar with nightly music, a Sunday jazz brunch, a restaurant with great views, and a friendly, intimate atmosphere. The prices are reasonable too, given Carmel's general standards. The rooms in the farmhouse are the least expensive. 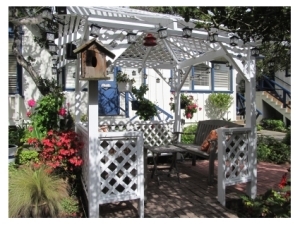 The Sea View is a characterful Moderate/Expensive option a few minutes’ walk from the center of Carmel and close to the beach. The house itself was built at the turn of the century and the owners have tried to keep that historic atmosphere. There are eight rooms, with the two most inexpensive rooms sharing a bathroom. The others all have private baths. There's free wi-fi, but this is definitely a getaway place and there are no TVs or phones in the rooms. Non-smoking, no children under-12.